Make the most of your CSA membership—or your garden harvest—with simple yet bold, inventive yet nourishing meals from acclaimed blogger Linda Ly. Community Supported Agriculture (CSA) programs have connected farms to consumers and made people more in tune with where their food comes from, but still leave many stumped beyond the conventional uses for their produce. How many times has a CSA share arrived with things you've never seen before or not known what to do with? The CSA Cookbook will help you cook your way through a CSA box (or farmers' market or backyard bounty) with 105 seasonal recipes that utilize every edible part of the plant, from leaves and flowers to stems and seeds. Think of it as a nose-to-tail approach—for vegetables! With innovative ideas for preparing the lesser-known but no-less-delicious parts of plants, tips for using the odds and ends of vegetables, and easy preservation techniques, Linda Ly helps you get from farm to table without a fuss. Chapters include tomatoes and peppers, leafy greens, peas and beans, bulbs and stems, roots and tubers, melons and gourds, and flowers and herbs. You'll find globally-inspired, vegetable-focused recipes that turn a single plant into several meals—take squash, for instance. This year-round vegetable brings a variety of tastes and textures to the table: Squash Blossom and Roasted Poblano Tacos, Sicilian Squash Shoot Soup, Autumn Acorn Squash Stuffed with Kale, Cranberries, and Walnuts, and Toasted Pumpkin Seeds. If you grow your own food at home, you might be surprised to learn you can eat the leaves from your pepper plants, or pickle the seed pods from your radishes. The CSA Cookbook aims to inspire curiosity in the garden and creativity in the kitchen. You'll look at vegetables in a whole new way and think twice before you discard your kitchen "scraps"! 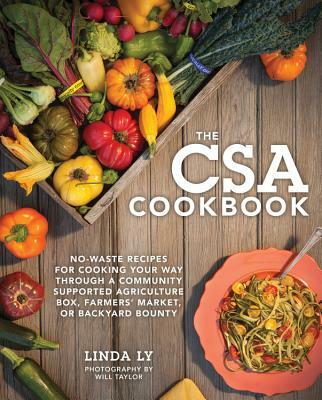 Linda Ly is the author of The New Camp Cookbook and The CSA Cookbook and the blogger behind the award-winning gardenbetty.com, a lifestyle site devoted to modern homesteading, green living, and adventure traveling. Nearly two million visitors turn to the blog every year for inspiration, tips, and tricks for eating well and living well, both in their backyards and in the great outdoors. Linda has been featured in national and regional media including Country Living, HGTV, Better Homes & Gardens, and Heritage Radio Network. Her passion for camping and cooking has taken her all over the American West, but she calls Bend, Oregon, home. Will Taylor's lifelong devotion to photography began in grammar school when he started building 110 kit cameras. His love for that clicking shutter never abated. He is now an award-winning commercial and editorial fashion photographer, shooting magazine covers and celebrities for clients worldwide. Still, Will lives for all types of photography--from nature photography to cookbooks--and focusing on the art behind every shot. When not hiding behind his lens or computer screen, Will enjoys escaping into nature with his wife and friends, searching for that next bluebird powder day, glassy peeling wave, or meandering river.